The good, the bad, and the ugly of Citi Field, brought to you in pictures. View the photos, read my remarks, and form your own opinion … or wait another two weeks and try to scalp a ticket so you can see the place for yourself. 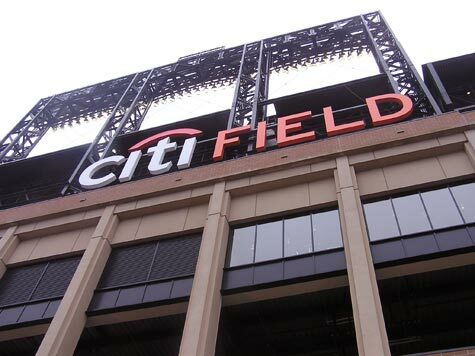 Thanks to fellow blogger Andrew Vazzano of TheRopolitans, I was able to attend the very first baseball game ever played at Citi Field, between the St. John’s Red Storm and the Georgetown Hoyas. While there, I took a bunch of pictures to give you an idea of what the new stadium is like. Unfortunately, the day was dreary, with gray skies and a constant mist, so all the photos came out similarly drab and colorless. Since there have been several photo and video “tours” on other blogs, I’ve tried to assemble more esoteric points of interest around the park. What was most strange about this day was that it is likely the only time the stadium will look so sparse of spectators, despite being a sellout. All 42,000 seats were sold — within 45 minutes of going on sale on the internet — yet the majority of folks were walking around the inner guts of the stadium to check everything out rather than sitting in their seats. All photos have been published as a series, and this is article number one. More than 20 photos and descriptions are included, to guide you through this virtual tour of Citi Field on a rainy Sunday afternoon. Click the links below this post to navigate through. Back Phillies Fan Booted From Citi Field! Joe, I want to know what you did to piss off Matt Cerrone and company over at metsblog. They have a big post today running down a list of what different blogs have to say about the new Citi Field, but strangely enough no mention of Joe Janish or Mets Today. This is on top of the last several weeks (or has it been months) of no mentions or links to Mets Today on metsblog, though it seems like they try to provide some sort of morsel from every blog associated with the Mets regardless of how small of a following or disorganized of a blog. What gives? If it’s because a few snobs with no imagination or humor didn’t like the handful of contributions you made over there, then that’s garbage. Some of your views may not be popular, but Cerrone is certainly doing a discredit to the fans by purposely not including links to your work on his site. I know it won’t make much of a difference, but if the reason is that petty then I’ll boycott metsblog just to make a statement. ‘dude, first of all, when I run for governor, or senator, or President, I’m hiring you as my campaign manager … thanks for the support! I certainly hope I didn’t piss off Matt Cerrone … I imagine that he’s simply trying to send people to some of the other sites in the Mets blogosphere. There was a time when MetsToday was not well known and it was links to here from Matt that helped establish the current readership — I know from discussions with him that he would like to do what he can to help out lesser-known blogs. And in all fairness, this series of posts on Citi Field is still not completed … if I had stayed up all Sunday night/morning and completed it, maybe Matt would’ve listed it on MetsBlog. Who knows, maybe he’ll throw some link love tomorrow. Thanks bud, I do appreciate your support and loyalty. I will be the first to admit the majority of the time Matt refers people to my site is because I send him links to post and hope it happens. Most of the time he is accommodating and sometimes even spells my name correctly. This site in particular is definitely deserving of a little more love though. The folks at Amazin’ Avenue are really good about searching out good content for their “Daily Applesauce.” As long as Joe keeps writing about the Mets and not Peacocks, this site will be successful regardless of who links. HEY! What’s wrong with the Peacocks???? There’s no other athletic team in the world named the Peacocks, except for those from Saint Peter’s College … that’s got to count for something, no?